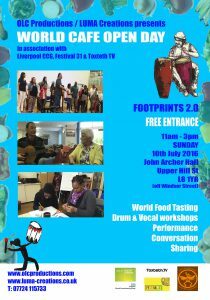 As part of our Liverpool CCG project, FOOTPRINTS 2 we are delivering the World Café Open Day on Sunday 10th July at John Archer Hall, L8 1YR in association with Festival 31 and Toxteth TV. There will be some workshops, sharing, conversation and lots of wonderful home made food from across the world. Entrance is Free and everyone is welcome.